A fried chicken joint with a Korean twist. If there’s a god of fried chicken, Chick ’n’ Sours is His greatest gift. 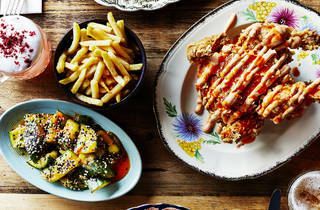 Born into a city awash with chicken shops in 2015, the first, Dalston-based branch of this restaurant ruffled all the right feathers with their cocktails and game-changing KFC (that’s Korean Fried Chicken, but you knew that). 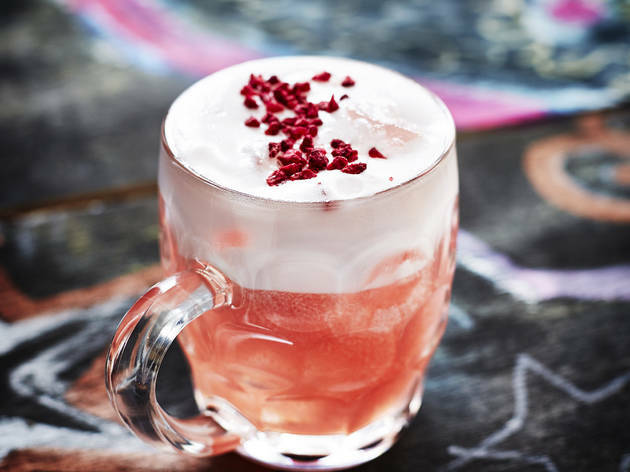 Now, just over a year and a half later and we’ve been blessed with the Second Coming: a new branch of Chick ’n’ Sours has landed near Covent Garden. And trust me, this one’s every bit as barnstorming as the first. Set in a basement off Seven Dials, the vibe is somewhere between house party and Prohibition speakeasy. It works. There’s a liquor bar in the middle, a playlist of absolute bangers (when has jamming to The Human League at lunchtime ever felt this right? ), and the chicken comes served on granny’s best china plates. By the time I’d tasted my first sour – fruity, sharp and packing a powerful tequila punch – I was pretty much ready to go out. That was until the speciality K-Pop burger arrived, at which point I realised that no amount of Friday Feeling was tempting me away from this table. Impossibly juicy and over four inches tall, the K-Pop is a burger worth getting your hands dirty for. That batter, for starters. 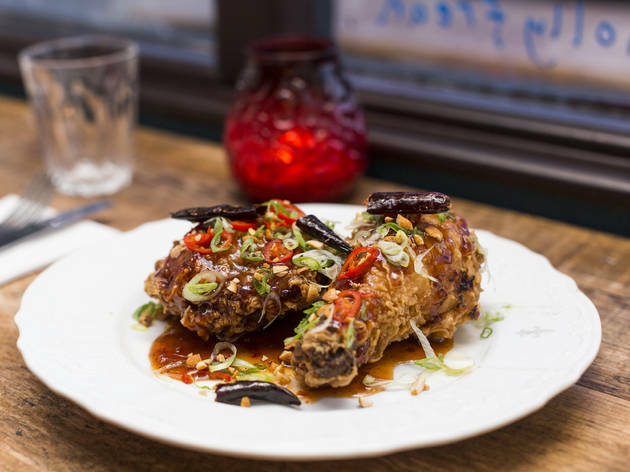 Chef and owner Carl Clarke double-fries his birds in rapeseed oil like the Koreans do, to achieve a properly luxurious crunch without any of the oiliness of a late-night Chicken Cottage binge. 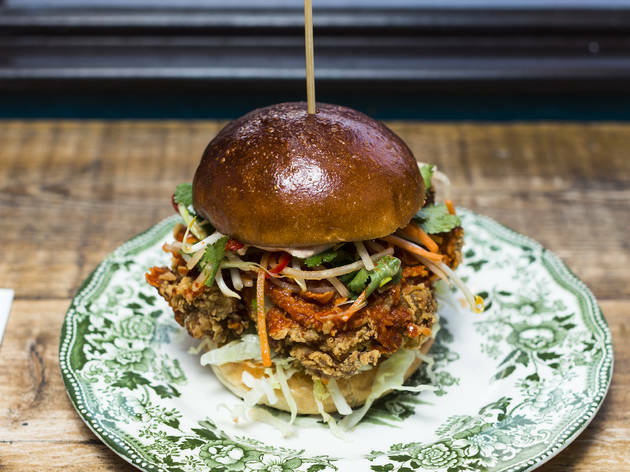 What really made this bird sing, though, was its acidity: the bun is dressed with gochujang (an umami-tastic red chilli paste) mayo on the one side, fiery sriracha on the other, and cut through with kimchi, chilli vinegar and sour Asian slaw. The sweet-sticky disco wings that followed were almost as good: that balance – between meaty fry and zingy sauce – is tricky to get right, but they’ve absolutely nailed it. It’s this mastery of creativity without compromise that makes Chick ’n’ Sours so special. Every dish comes fresh with a little surprise – from the peanut in the pickled watermelon salad to the chives in the sriracha sour cream (take note of this dip, people: it’s basically condiment crack) – but somehow, nothing ever feels OTT. Chick ’n’ Sours’s tagline is #nextlevel – the kind of bunkum that would usually make me run a mile – but it actually is. Let us all give thanks to the chicken god. I love fried chicken. Just putting that out there. So stumbling across Chick n Sours was a revelation - also coz I was already a few pints in and craving something juicy. And the fact that the kitchen is right by the front door/Street window, they’ve figured out a good way to lure you in. A decent spontaneous find for a Wednesday evening, which appeared pretty busy, so god lord knows what happens on a busier night as this place is small. I may or may not have been misled by its size when looking at a conveniently placed floor-to-ceiling mirror that created the illusion of great depth. The food is decent, but by no means revelatory. The small surroundings do make it feel a little tight, and the music was possibly just a little too loud for a Wednesday. But service was great from an enthusiastic staff, while the nacho starter really helped stretch the stomach for some decent chicken. A nice treat for Wednesday, but it ain’t no family bucket. Good value, delicious and speedy! Perfect for a pre-theatre bite in Covent garden. The restaurant was very buzzy and fun even at 6pm on a Tuesday. The tables are very close together so best to avoid if you have a lot of bags! The General was delicious, perfect level of spice for someone who loves flavour but can't handle a lot of heat. Will definitely be back again soon! I am only giving this place four stars as the music is a little too loud for my liking - but other than that, the food, service, drinks, sides, furniture, simply everything is tip-top. The fried chicken is heavenly - the K-pop I tried was exciting, zingy, something totally different and I loved every bite. I read so many raving reviews about this place that I had to check it out. We had no reservation on a Friday night so really appreciated being seated straight away. We were however seated by the stairs (and it was freezing) and asked the hostess if it's possible to move us to another table. This was sort of ignored as we haven't heard from her again, but the food was super tasty with unique flavour combinations. We tried the General where the chicken was crispy to die for and the buttermilk and herb mayo fingerlickingly good. Sriracha sour cream is the stuff of wet dreams. Rum'n' rye was citrus-y with just the right amount of sourness. The vibe was very cool and relaxed with great choice of music (90's R'n'B on a Friday night, anyone?) The experience was again a bit shattered by the fact that they brought us the wrong bill - not once, but twice. 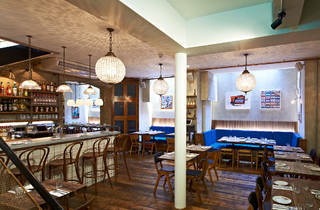 All in all, great food and atmosphere, but staff could be a little less aloof. This is a right good joint to visit, it is. I love fried chicken, I really despise places like KFC etc, so Chicken Sours is just the perfect cluckin’ haven I when it come to my fried chicken needs. The chicken is great, juicy and delightfully crispy, with their signature breaded coating. 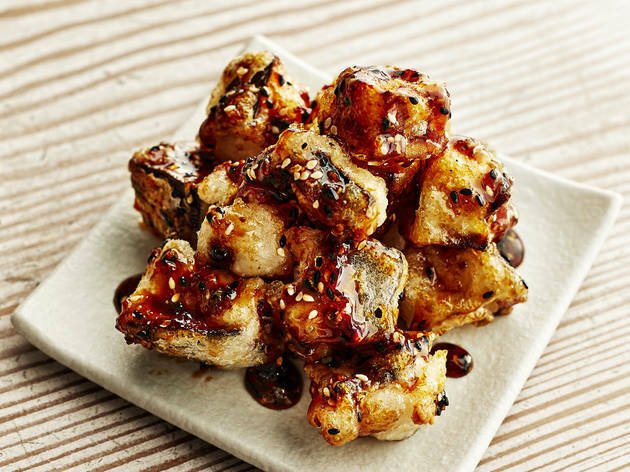 It’s a choice of burgers or strips and most dishes have some form of Pan-Asian twist to it. Big selection of booze to wash it down with too. The staff were stand out for me, so helpful and friendly. Totes worth the visit. Love love love this place. Chicken is sooooo good, in every shape and form they serve it in! The chicken tenders with kewpie mayo are my personal favourite. Cocktails are ridiculously good as well. Can't recommend this place enough for a casual night out with friends. Popped into Chick N Sours for a quick lunch stop whilst roaming around the Leicester Square/ Covent Garden area. The restaurant is held downstairs in a basement with cool effortless laid-back styling, chandeliers with exposed brickwork and wooden tables and chairs, it’s all very relaxed with funky background music. Tried the xian spiced tenders and my they were finger licking good and would recommend, the korean style crispy batter coating coupled with the siracha and yoghurt dipping sauce made for an great combination and were fried chicken perfection that I finished these off in no time. Dripping fries were quite plain and nothing special but complemented with chicken well. They have a bar down here and good selection of drinks, great spot to check out pre theatre if you happen to be in the Covent Garden area. We went for a pre-theatre meal at Chick 'n' Sours after reading raving reviews for this place. The decor of the place is really funky and the staff are an absolute delight. The food, however, we thought did not meet our high expectations. We had wings to start with, but the sauce tasted a bit diluted and lacked a punch. Then we ordered the Guest Chicken for mains and it tasted amazing, but there was too much batter on it. Most importantly, my wife and I both felt it was way too much for what it was. I know it's harsh, but I much rather prefer Nando's over it. Best fried chicken in London! 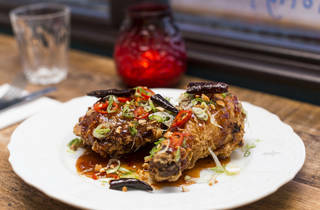 Down a little street in Covent Garden you'll find what is to many the Mecca of fried chicken. As you wander down the stairs into the main restaurant/bar, you are greeted with busy waiters and chatty tables whilst 80s hits blares from the speakers. I sat at the bar for my dinner and I got to watch the mixologist at work for the evening whilst I waited for my food to arrive. 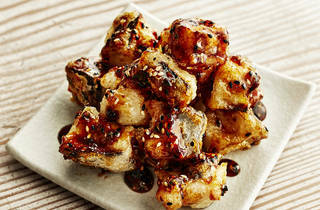 To start I had the Szechuan aubergine which were small fried balls that were light and moreish. For my mains I had the K-Pop burger with a Korean fried chicken fillet and Asian slaw. When it arrived I was amazed at the size, the portions here are bloody huge! I decided to sacrifice most of the bun in order to accomplish the chicken in totality and it was a challenge that I not only accepted, but won. On to the cocktails, and a sour of most kind is my type of drink so I thoroughly enjoyed sampling the menu. I left feel very full, content and slightly pissed and just writing this review is making my mouth water and I'm already planning to get my chick n sours fix very soon. I can't believe it has taken me this long to put in a review for this delicious place! I have not eaten inside but have only done takeaway since I live almost next door. Their colonel chicken is what I normally order. The chicken filet is massive, these guys are not cheap with their ingredients. What I like about it is you can put in order online then pick the food up at arranged time. For 10 quid, you'll get yourself enough food to even split them into two meals. This is what I called a fried chicken sandwich! Chick n Sours doesn't look like much from street level but opens up downstairs into quite a big restaurant. They have about eight cocktails to choose from, including pisco sours obviously, costing only £7 and £8! Being vegetarian I had to miss out on the incredibly crispy appealing fried chicken but luckily they had a soy mushroom sandwich and choice of salads and fries to tide me over. The music is retro upbeat but not too loud to talk over and the restaurant feels quite light and open despite being in a basement. I sat at the bar for a quick pre theatre meal where it was entertaining to watch the cocktails being made. The bar tender was really up for explaining the drinks menu and providing tasters of ingredients as he went along. The mushroom burger was enormous and incredibly filling. As an added comfort there was a pack of baby wipes at the bar which were very needed afterwards. The only thing I would have changed was asking for no processed American cheese on the burger. I really liked how they served everything on mix matched vintage dishes. As a fun touch the bill was brought in an egg, with chicken tattoos inside. Definitely a fun and memorable meal! Went here for their March special and the burger was absolutely phenomenal. You will not be disappointed by the size of these burgers and if you like chicken, you will fall in love with this place. It's not hard to see why this place has a waiting list a mile long. Loved the casual feeling and vibes of the interior as well (the staff were super friendly and knowledgable as well). Happy days, well worth a visit. Despite being busy the service was fast and friendly. Would defo recommend to anyone curious or passing by. Popped along for a Friday lunch. Was a little hungover. The grapefruit house soda was very tasty and perfectly tart. I had the sweet and sour fried chicken - a very decent sized portion. Crisp and tasty and very tangy, well balanced sauce. The sides are unusual and delicious - spicy cucumbers and green slaw, My only slight pause is the total bill tots up to a fair amount - about £20 ahead which seems a bit pricy for what it is. That said I would like to go back. If you say 'Chick 'n' Sours is a fried chicken restaurant', you might as well be announcing 'London is quite a big town' - you've just got it wrong! Chick 'n' Sours is so much more - a crazy Asian-inspired, with American (the Colonel burger) and British (dripping chips) thrown in for very good measure. Everything we ordered was unexpected, but brilliant. The Nachos were proper tangy, sticky and unlike and I have tried before, in the very best of ways; my cocktail had vinegar in it, but it was the ideal accompaniment to the hot, sticky, chicken wings; the K-pop burger, with Asian coleslaw was a revelation and will be again this lunchtime (I couldn't bear to leave leftovers). On-top of this the portions were huge, the prices reasonable and the atmosphere cheerful. Winner winner chicken dinner. Ace birds. Watermelon ace, too. Sours also ace. All ace. Amazing chicken, but the Asian flavours smattered through the menu are what really makes it stand out. These give everything the kick that helps it rise above your everyday chicken place. Sides in particular stood out, with aubergine and cucumber my personal favourites. Cocktails are great too, and all at the sort of price that makes it easy to order far too much. Very likely to become a regular. Went on a recommendation from a colleague and definitely worth every penny! We ate "family style" with a few starters, sides and mains between 5 of us and was thoroughly impressed with everything they brought out. Cocktails were not too shabby either and for the price, we left feeling very full and very impressed. When it comes to fried chicken, this is a winner. 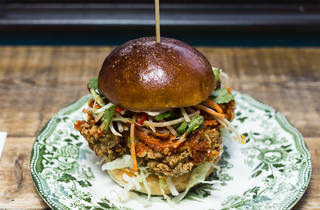 Quite possibly the biggest, crispy chicken burger you will ever have that actually tastes fantastic. Knife and fork job as too much to pick up. Great sauce in the bun and some interesting pickled veg. Dipped in the hot sauce. Amazing. Fries were excellent as well. Very busy at lunchtimes so plan ahead on this one, don't see it getting quiet any time soon when serving food that good. Crispy chicken doesn't get crispier than this. As the name suggests, you should like eating chicken if you're going in. Start with the wings and then try the K-Pop burger with the Asian slaw. Not a personal fan of their dripping fries but the pickled watermelon and the green slaw cut through all the chicken-y goodness and tasted ace. All very nice in theory but we got here on a Friday night before 8pm and they'd run out of buns! Staff was hugely unsympathetic about the fact that the Korean bun was our dish of destiny and we left after just a starter! I had been very reliably informed that this is a place to go to for a wonderful twist on fried chicken. You could be fooled by thinking it is just an upmarket KFC, but it is not. It is, as Chick n' Sours say themselves a great restaurant masquerading as a chicken shop! 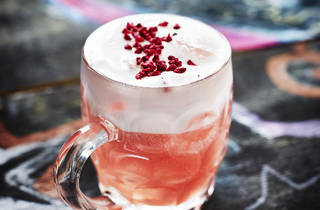 And what KFC ever offered a wonderful range of sour cocktails, for which these guys have created their own twists on. The Asian twists on the fried chicken are excellent. It gets busy, so book in advance! On our visit they did get part of the order wrong, they spotted it and corrected it quickly. 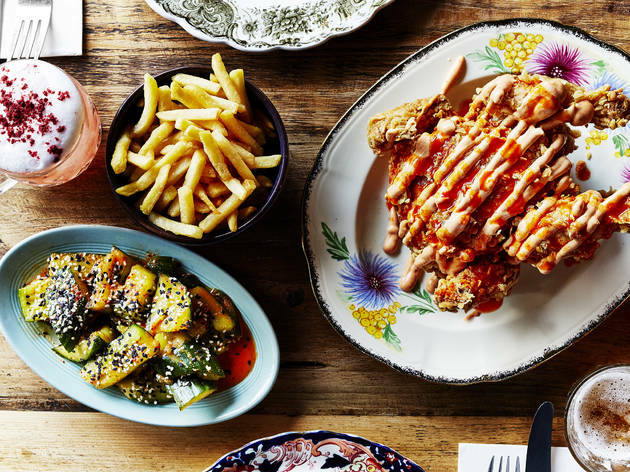 Chick'n Sours in Seven Dials is the latest addition to the fried chicken craze storming up Soho and probably the one I would go back to. Don't expect regular fried chicken here: they have a twist on everything mostly experimenting with Asian flavors, such as the Korean Fried chicken bun with Asian cole slaw or chicken wings with sticky sauce that can be ordered with Sriracha Mayo. The portions are huge and ones to share and gulp down with their sours. Oh, and not to forget those beef dripping fries.. They were heavenly fresh out of the frier. 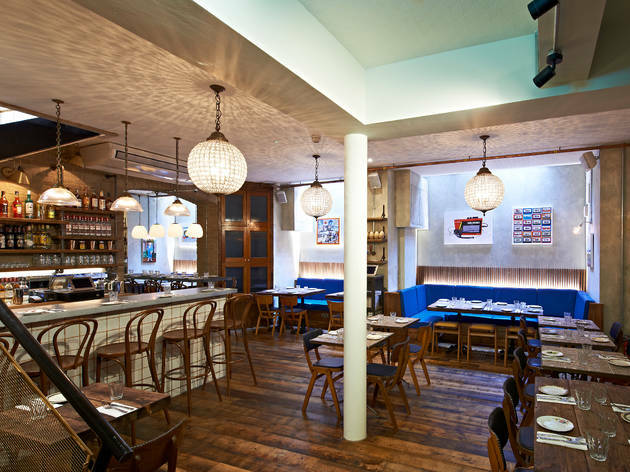 The East London cool has finally arrived in Seven Dials. I feel awful rating Chick N Sourz 3* however it is 7/10 place - never never 8! Really friendly staff and very quick service. The food is tasty but just not quite there. Lovely, fresh coleslaw, nice dip with the tenders, however the chicken tenders were bland and there wasn't much to the House Fry. Beef dripping chips were good but tasted like MacDonalds fries. Overall OK just nothin' special.